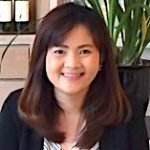 A large bank in the Association of Southeast Asian Nations (ASEAN) plans to develop a new mobile back-end application using microservices and container technology. They expect the platform to be able to support 10,000,000 customers with 5,000 TPS. 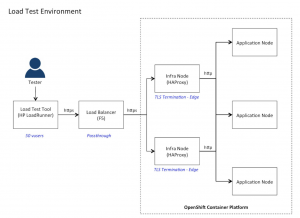 They decided to use Red Hat OpenShift Container Platform (OCP) as the runtime platform for this application. To ensure that this platform is able to support their throughput requirements and future growth rate, they have performed internal load testing with their infrastructure and mock-up services. This article will share the lessons learned load testing Red Hat OpenShift Container Platform. 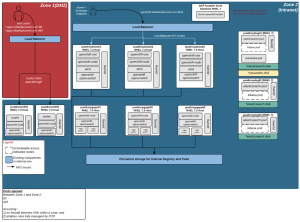 The picture below shows the deployment architecture of OCP in a non-production environment, which is the load testing environment. The OCP version is version 3.5. HP LoadRunner is the standard non-functional testing tool of the bank. Therefore for this load testing, the bank uses HP LoadRunner. 2 Infra nodes (4 cores) with 2 Routers. 3 Application nodes (8 cores). 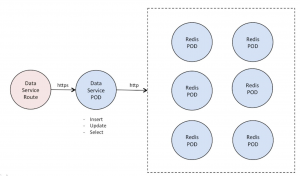 1 Data Service pod and 6 Redis pod. 1 HP LoadRunner server with 50 vuser. The E2E throughput is way too low compared to the expected throughput. The response time at the service level is less than 1 ms while the E2E response time is 150 ms. The suspected culprit of the root cause is the TLS termination process at the Router node. The 2 Infra nodes can have only 2 Router pods and cannot scale out anymore. With Red Hat support, the bank noticed that the Router pod is a “special” pod, and it opens/uses port 80 of the Node host. So, 1 Router can only be deployed on 1 Infra node. For the infrastructure node, increase the number of CPU cores from 4 to 8 cores. 2 Infra nodes (8 cores) with 2 Routers. 6 Data Service pod and 6 Redis pod. The E2E throughput is improved about 2 times and the CPU of infra nodes are fully utilized. The E2E response is significantly reduced from 150 ms to 20 ms. The load can go to the Data Service more, so it has to scale out to 6 pods to handle more workload. The CPU Utilization of the infrastructure node is very high. The bank found the error -27774 “Server shut connection during attempt to negotiate SSL connection” occurs at HP LoadRunner tool a lot. When this error starts occurring, the throughput starts dropping. The error rate is about 5%. Also, the CPU utilization of the load test tool is very high, about 80-90%. Increase the number of CPU cores from 8 to 16 cores in the Infrastructure nodes. Increase the number of HP LoadRunner server from 1 to 2. 2 Infra nodes (16 cores) with 2 Routers. 6 Data Service pods and 6 Redis pods. 2 HP LoadRunner servers with 50 vuser. The E2E throughput is improved from 600 to 1000 TPS. Increasing the number of CPU cores of Infra node reduces the CPU utilization from 80% to 30%. The bank still found the error -27774 at HP LoadRunner tool occurs a lot. When this error starts occurring, the throughput starts dropping. The error rate is about 1%. The -27774″ error of more than 80% could be due to the HP LoadRunner configuration itself. The bank did some adjustments on the HAProxy configurations including maxconn, tune.bufsize, tune.ssl.default-dh.param, stats timeout, and timeout check. Anyway, they found that these parameters don’t have any impact on our testing result. Because of the error -27774 at HP LoadRunner, the bank decided to explore another load testing tool using JMeter. 1 JMeter server with 100 threads. The E2E throughput is significantly improved and nearly meets their target. The load can go to the Data Service more, so it has to scale out to 9 pods to handle more workload. JMeter as a load testing tool plays a critical factor to the above result. It gives a different perspective and it opens a new horizon on fine tuning other components outside HAProxy. The root cause of the low throughput previously might come from HP LoadRunner itself. Even though the load test result from JMeter is very good, the bank still needs to continue finding the root cause of HP LoadRunner because it’s the standard non-functional test of the bank. 2 HP LoadRunner servers with 50 users. After investigating the HP LoadRunner -27774 errors, the bank found that if they change the keep-alive from true to false, the -27774 error rate is dramatically reduced. However, they found another error of high CPU utilization in the load testing server. The load test result with HP LoadRunner meets the customer’s throughput expectation. The load test tool configuration is impacting the load test result. Because the CPU utilization of infra node is about 30%, the bank will reduce the number of CPU cores of infra node from 16 to 8. Then they will do the load test again. They would like to get the infra node sizing guideline for their platform. This load test is based on the router’s default certificate for TLS termination. The bank will use their certification and continue on the load test. The bank will do more E2E integration testing with their back-end systems, front-end applications, and security infrastructure. Allocate enough Infra nodes for Routers, with higher CPU allocation to handle more requests, especially if you are using a Secure Route with edge termination or reencrypt TLS. Example: nbproc=2 for a 4 CPU node often gives more throughput compared to maximizing nbproc value to 4. Increase the maxconn config using ROUTER_MAX_CONNECTIONS environment variable in DeploymentConfig. In OCP 3.5 we can modify the maxconn value of HAProxy config to increase the default value of 2000. You may also need to adjust the value of timeout connect using: ROUTER_DEFAULT_CONNECT_TIMEOUT, timeout server using ROUTER_DEFAULT_SERVER_TIMEOUT, and then timeout client using ROUTER_DEFAULT_CLIENT_TIMEOUT respectively. HP LoadRunner error “Server shut connection during an attempt to negotiate SSL session” of more than 80% is due to an HP LoadRunner configuration issue. These links [k][l][m] provide the information on how to troubleshoot it. The other candidates for a load testing tool are JMeter [n] and Gatling [o]. 3. Monitor and scale out the service to ensure that it’s able to handle the workload.